In late 2016, on a very cold day members of the Society ventured out into the wind-swept fields to carry out some archaeological excavations. The reason for digging at this time of the year was that an American film crew was looking to produce an episode of a TV exploration series based on the search for King John's Royal treasure that was, allegedly, lost somewhere in the Wash. The series had researched the background from archives in Norwich and London and concluded that the incident could only have occurred on one of the very few places where the marshland could be crossed in medieval times. King John died shortly after the incident, and the kingdom was in turmoil for a time and so the actual crossing place, was not recorded in the historical records. A recent aerial survey conducted using LIDAR had enabled the medieval land surface to be recreated for that period, but the actual route and the distance traversed by the King's baggage before disaster struck could not be determined. A possible clue to the path of the baggage train was finds of artefacts from the period, they indicated that a farm in the area was likely to have had high status travellers crossing it in medieval times. The location was selected, close to Tydd St Giles, Cambridgeshire from a review of the LIDAR data by Dr. Ben Robinson. The key indicator for the location was that this was the shortest distance across the River Nene and its Washes at the time. The particular site was know to have generated medieval and other material from the ploughed fields, but also it was situated near to two Drove Ways/routes, of the period. Geophysics: conducted by Dr. Martin Bates, University of Wales, Lampeter. Closed auger survey: to sample the buried strata of the laminated flood silts, with peat horizons across (University of Wales, Lampeter, Dr. Martin Bates). 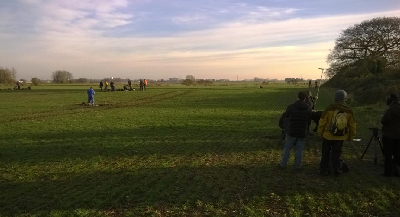 The strategy was to sample the plough zone archaeology with metal detector survey, and then review the relationship between the assemblages in the plough zone (metal objects and pottery), and that in the subsoil via test pitting. Dr Clive Bond directed the fieldwork, and his approach was consistent with commercial and research-led approaches to this type of rural site. The investigation team was comprised of society members (survey and test pitting), professional archaeologists (Geophysics) and members of the local Metal Detecting club (Wide area detecting). We were also joined by the farmer and his family who were keenly interested in the history of the farm and also in learning about archaeology. Interest centred on two fields where there had been past finds and also on the area surrounding the farm buildings which, being on high ground, could have been an occupation site in medieval times. A grid was laid out for detecting and test pit locations decided from the artefact finds and the ground topology. Work started although the ground was rock-hard but digging the 1m square pits was difficult and we only progressed about two contexts (20cm) on the first day. Although the filming had not yet started the production team had arrived and made us welcome a hot lunch plus lots of searching questions. The second day was more productive as the weather had improved considerable, digging was easier and filming had started, which was great for excavation motivation. Test pits had now penetrative the upper 'plough-soil' level and were beginning to produce results too! Working in close conjunction with the detectors (sieving the compacted soil was still difficult) a number of artefacts were unearthed which confirmed that the site was active in King John's day. Luckily, the metal detecting and test pits, did generate material of the correct date 1216 (King John's visit), 13th Century. Some of this material is high status, indicating an administrative function, or writing, on site e.g. seal matrices. Even some of the lesser status finds, such as iron nails, fittings, from test pits may well also suggest buildings, even if only temporary in use. Sadly we didn't find the Medieval English Crown jewels but we did find a site that was active in King John's time. As the Wash's salt mashes were sparely populated during that period it is likely that this was on one of the possible routes that John's baggage train would have used. The society also collected items that are being studied so that a clearer picture of the marshlands and their use during this period can be determined. We also had a great time and met up with both professionals and detectorists who were keen to show us how they worked. There was a super lunch on the 'Filming Day' especially brought out to us from Marriott's in Kings Lynn. The TV series is aimed at a wide public audience and as such the language used is non-technical and the programmes aimed as entertaining. The episode on King John and the loss of the English Royal Regalia followed these aims but was a serious programme dealing with the history and archaeology surrounding them. The archaeology carried out was limited in scope but never-the-less carried out to professional standards, no cutting of corners! 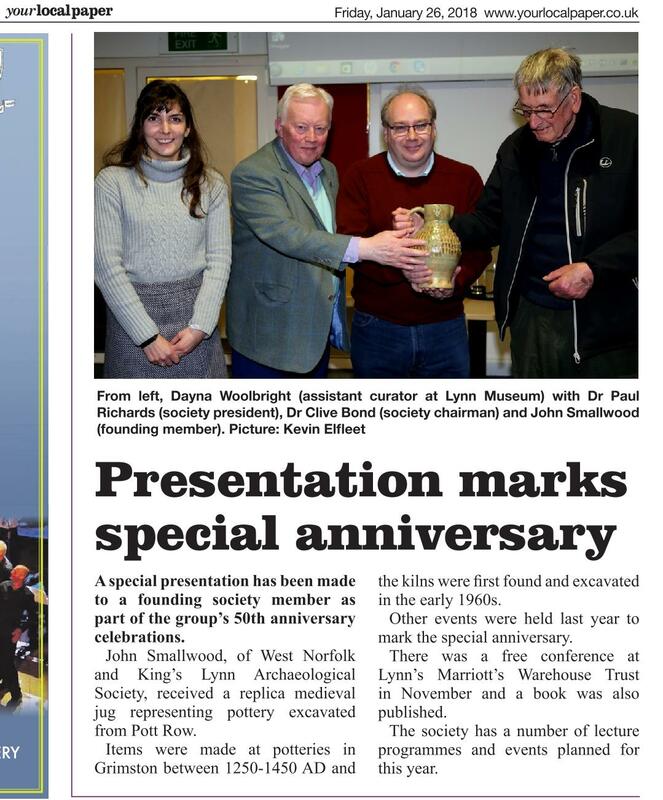 It also showed how professional and amateurs could work together and how archaeologists working with detectorists could gain a lot of information about a site in a very short period of time. The programme itself was very well received by the viewing public in the US and it obtained the highest audience ratings in all the three series of the programme. It was certainly fun for us to work with the TV company and I hope we may get the opportunity to do so again in the future. The society was lucky to have the producer return and present a viewing of the episode at a meeting, where he answered questions and described the results that had been obtained. A selection of the artefacts found on the days was also on show for both viewing and handling.